Home > Are You Ready for SA-CCR? Are You Ready for SA-CCR? 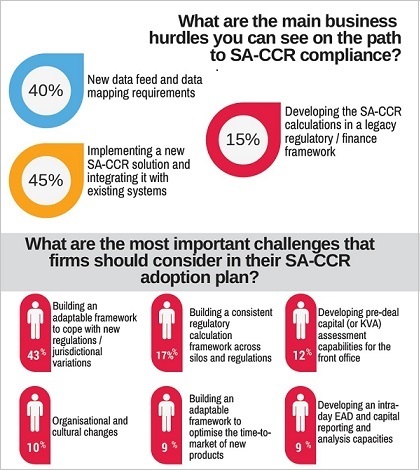 Inforgraphic: Are you ready for SA-CCR? The implementation deadline for the Standardised Approach for measuring Counterparty Credit Risk exposures (SA-CCR) is fast approaching. The requirements to comply have created several complex challenges for financial institutions, and action is needed now in order to meet the impending regulatory standards in a time and cost-effective way. Murex's enterprise-wide SA-CCR solution works within the MX.3 framework to address these challenges and deliver the real-time risk and capital management functions that our clients need. In this infographic, Murex explores both the regulatory and business hurdles presented by the SA-CCR. In a recent webinar we hosted in partnership with DerivSource, we asked attendees what issues were most important to them when considering their SA-CCR adoption plans and what stage of implementation they are currently at. Want to learn more on SA-CCR? Please contact us.